Every day, we aim to create unexpected moments of happiness. And each year, we celebrate our birthday by doing just that, handing out thousands of free pops around Atlanta in the process. It's our small way of kicking off the pop-slinging season and expressing gratitude to our hometown. ATL is home to many humble, creative, and proactive people working each day to strengthen our community. It’s one of the—many, many—reasons we love our hometown. So when we sat down with Mailchimp, our long time opening day sponsor, to discuss this year’s partnership, we saw an opportunity to honor community groups that are making Atlanta better, weirder, and more human. Atlanta Cycling Festival celebrates our hometown bike community by offering dozens of rides, workshops, and events for some 3,300 cyclists. The organizers aim to connect anyone on two wheels, no matter their level of experience, to all ATL has to offer riders. This year’s festival runs May 11-17, so grab your helmet and join their Intercontinental Fancy Cocktail Ride or the closing concert at Quarry Yards. Oh, and did we mention it’s all free? Concrete Jungle transforms overlooked and underutilized fruit trees and land into a healthy food source for food banks, shelters, and people in need. Since their founding in 2009, teams of volunteers have scurried, shaken, and picked more than 374,000 servings of apples, persimmons, serviceberries, and more. Join them on May 19th for their Spectacular Fruit Ramble to find fruit treasures around East Atlanta or grab a copy of their foraged fruit cookbook featuring recipes such as kudzu lemonade and mulberry sorbet. Soccer in the Streets cultivates healthy communities through sports-based youth development, serving over 5,000 young people annually. They’ve gained worldwide recognition for pioneering StationSoccer, an initiative that brings soccer fields and community classrooms to MARTA transit stations. Dust off your cleats and head to the Five Points or West End MARTA stations to join their youth and adult pick-up games. 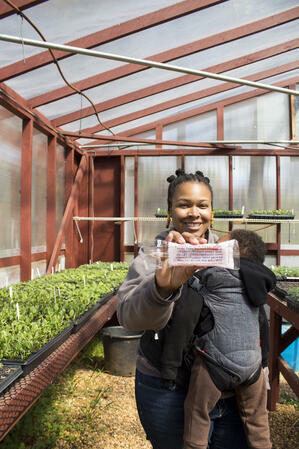 Truly Living Well for Natural Urban Agriculture grows food, grows people, and grows community. Urban agriculture is the tool they use to address issues related to food access, environmental quality, employment and urban vitality. They believe that access to fresh, healthy food should be a right, not a privilege. That’s why they grow 30,000 pounds of fresh food each year at their Collegetown and East Point farms. They also regularly host gardening classes and weekend workshops, teaching their neighbors to build small businesses by growing food. Stop by their farmers market each Friday for organic produce, fresh flowers, and more. Enjoy a free pop on our birthday (April 1st at our regular cart spots), courtesy of Mailchimp, and get involved with one or all of these organizations. See you on the streets! The key to Employee Appreciation = Actual Appreciation ... then take them on a cruise.